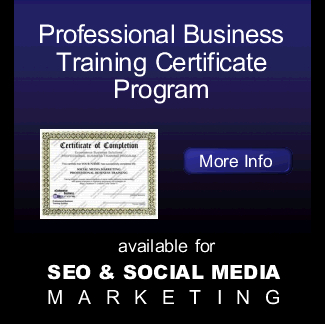 Training course outline: You receive the exact curriculum as the Facebook Training Course in-class training. Training Sessions: 2 x 1.75 hour online class sessions. Training course outline: You receive the exact curriculum as the LinkedIn Training Course in-class course. Training course outline: You receive the exact curriculum as the Twitter Training in-class course. Training course outline: You receive the exact curriculum as the Blog Training Course in-class course. Training Sessions: 3 x 1.75 hour online class sessions. Speaker & Microphone - Headsets are highly recommended to reduce speaker interference with microphone, but not required. All questions can also be entered in chat box if needed. The instructor will attend to them on-going during class. Special note: Instructor may mute attendees that their microphone causes excessive interference. In completion of payment registration, email will be sent to you 2 days before the training. This email will provide the private access link to the online training room and a pdf copy of the lecture notes. We recommend to print the lecture notes prior to the online training class. So you can follow through the lessons and add your own additional notes. Cancellation Policy: We do not provide refunds for cancellation, but allow rescheduling. You are allowed to reschedule up-to 3 times within 3 months. You MUST notify us at least 3 days before your scheduled class to reschedule your training. A penalty fee of $25 plus HST will be charged with notification of rescheduling less than 3 days.